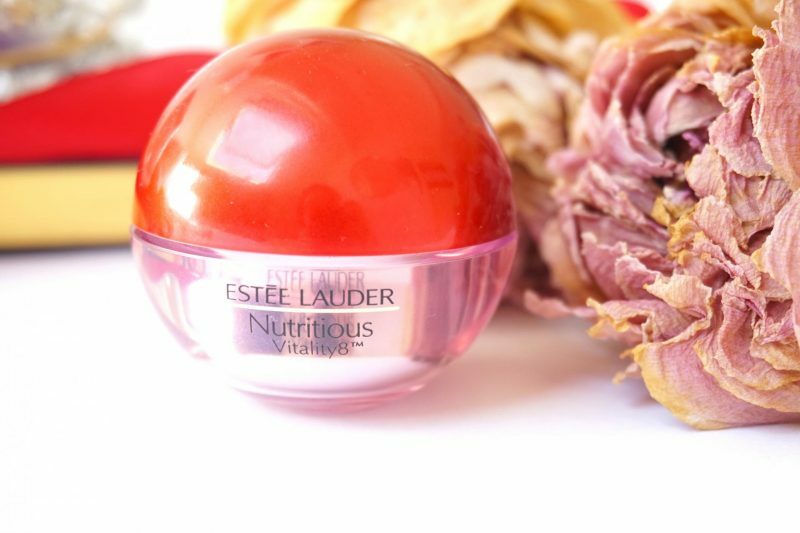 Today I will talk about the Estée Lauder Nutritious Vitality8 Radiant Eye Jelly. Yes it has a really long name but just remember it as the Radiant Eye Jelly. 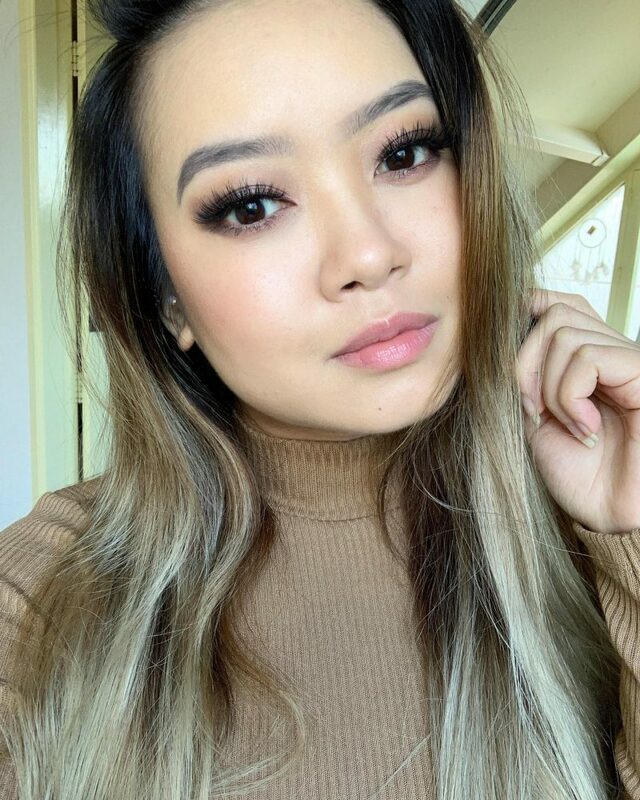 This eye cream is specially designed for the Asian skin, because as you may know (or when you have Asian genes) our eyes can be very swollen when we wake up, even when we had our 5 steps skincare routine the night before. Or you are not Asian but just has a hectic life with a lack of sleep. Doesn’t matter: if you are looking for a cooling and hydrating eyecream, this is something you need! A beautiful container with a funny texture, I bet you have never seen something like this before. Let’s get started! Pure radiance. Pure performance. 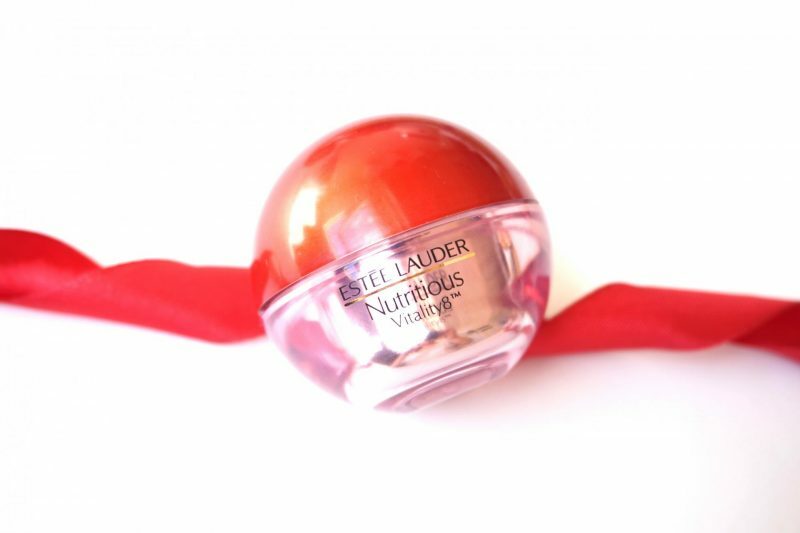 A ball of energy and nutrients for radiant eyes. 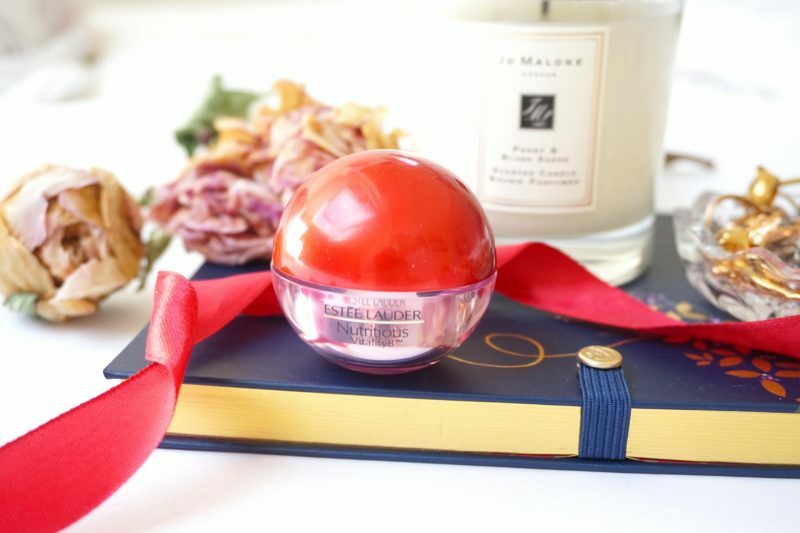 Jam-packed with moisture and energy, this cooling jelly instantly revitalizes the delicate eye area. Infuses skin with a burst of all-day hydration to help smooth fine, dry lines. This is the cutest eyecream jar I’ve ever seen! I was so excited when I received the product. First I was “hmm a round lid, how hard would it be to open it?”. Well, not that hard. Surprisingly it is very easy to open it. Inside the bottom part the eyecream is stored in a round compartment. The amount of product isn’t the same as the size of the jar. 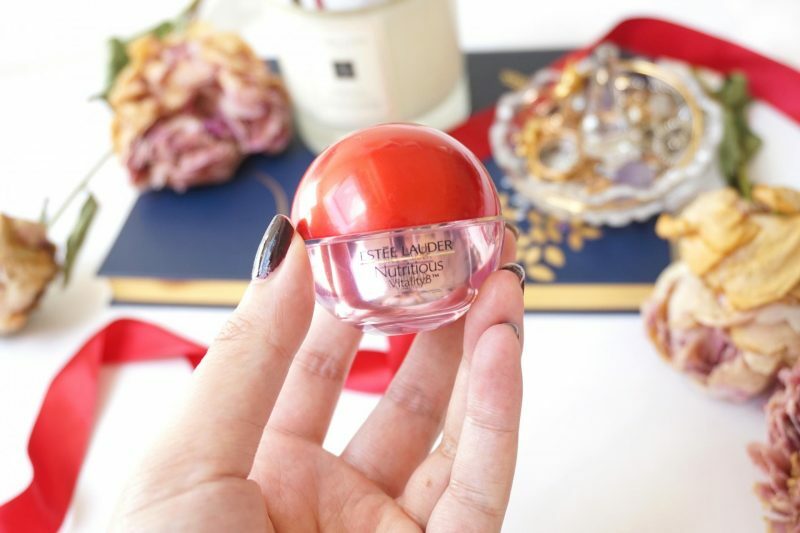 I’m a big fan of the red packaging of the Nutritious line, is totally fits with this eyecream because of the pomegranate ingredients and Asian influences. 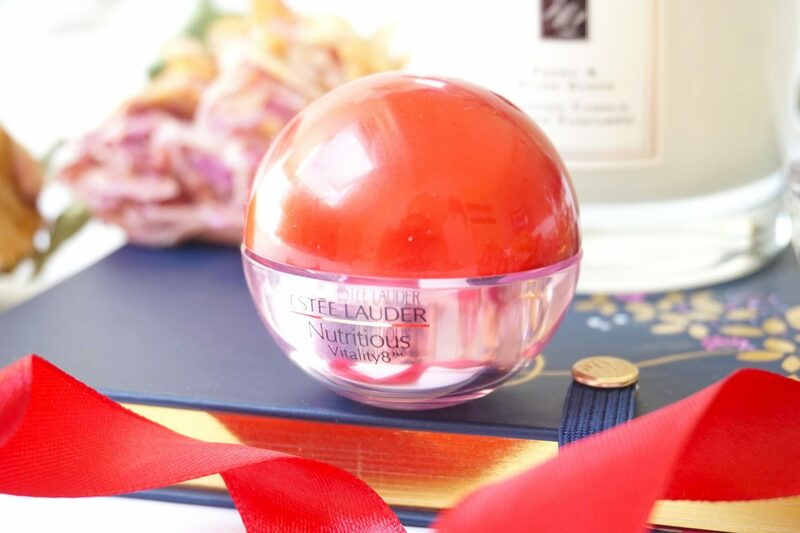 What makes this eyecream so special is the texture. It is something I didn’t see yet at the Western market, only in Asia with Korean of Japanese brands. The cream isn’t just a cream, it is a jelly pack. The moment when you dip your finger on the surface, it starts to ‘melt’. Doesn’t overdo it because with a little gentle touch you can get that enough product for both eyes. At the beginning I had some trouble with figuring out how to use my fingers with this jelly. I realized that the jelly almost feels weightless and that you can easily overuse it. Just use your ring finger, touch the surface and make 2 little circles. Don’t push! Just gently lay your finger on it. It is the funniest thing you will ever feel! Everytime when I used the eyecream, it look brand new. The jelly will create an even layer at the surface like it has never been touched. This jelly contains pomegranate extract, mangosteen, super berries and more. I can tell you that this jelly smells super refreshing and I can agree that it definitely contains a lot of super fruits. You instantly will notice a subtile sweet scent of fresh fruits with a cold breeze. It is just super fresh and I can imagine that all of these ingredients will create a fresh and cooling effect on the skin. Oh, and did I already tell you that it also contains a hint of lotus flowers and pink orchidee? It really has an Asian twist to it! You will be surprised how fresh and sensational it smells. The first time when using this jelly I was super excited. I never used a jelly eyecream before, but I did use a jellypack for my face. I love the consistency, especially for my oily skin. Jelly has the function to be immediately absorbed by the skin the moment you apply it. It doesn’t leave a sticky feeling behind and usually created a cooling effect because of the texture. Beside the jelly I was also curious if I could see any differences in my skin. I often struggle with swollen eyes in the morning, even when I have enough sleep. Estée Lauder claims that after 8 days 96% of the Asian women noticed that their eyes were less swollen, looked younger and more beautiful. That sounds too amazing right? I can’t judge until it’s proven. The moment I opened the lid I was a bit surprised by the amount of the.”This won’t even last a month!“, it looked like such a tiny amount of product. I felt a bit betrayed. While poking my finger into the jelly I noticed the fresh and sweet scent of the jelly. Hmmm, I couldn’t wait to use it! Don’t be afraid because the sweet and flowery scent is super subtile, you’ll going to love it. I used my ring finger to pick up the jelly from the jar by simply making light circle motions on the surface of the jelly. It felt like it was melting beneath my finger. Just simply swipe it underneath the eyes and let’s start the magic! O my god, I know how jellypacks feels on my face as a moisturizer but this jelly eyecream is NEXT LEVEL! It has such a refreshing feeling for my eyes, I felt instantly awake. Not like you have mint underneath your eyes but in a way that is gently and subtile. The cooling effect made my eyes more open and I felt less tired. Before I knew it the jelly was dried up, it goes that fast. The first time when I used the jelly eyecream I couldn’t see any difference, ofcours because than it would be a miracle. I did feel a big difference when applying the jelly eyecream but nothing instantly in my skin. After using this eyecream for 3 weeks I can honestly tell you that everytime when I use it, it feels better and better. I love the cooling effect and the amazing scent. But the most important is: did it change my skin on the long-term? Yes, it did! When using the jelly eyecream consistence I noticed that my eyes didn’t become swollen anymore (okay, only once but I cried that night. emotional thoughts). My right eye as a very deep crease but the last week I couldn’t see it anymore. Even when I had makeup on all day. It disappeared? I think so! If you have swollen eyes, a hectic life with lack of sleep or you are Asian and have swollen eyes all the time? 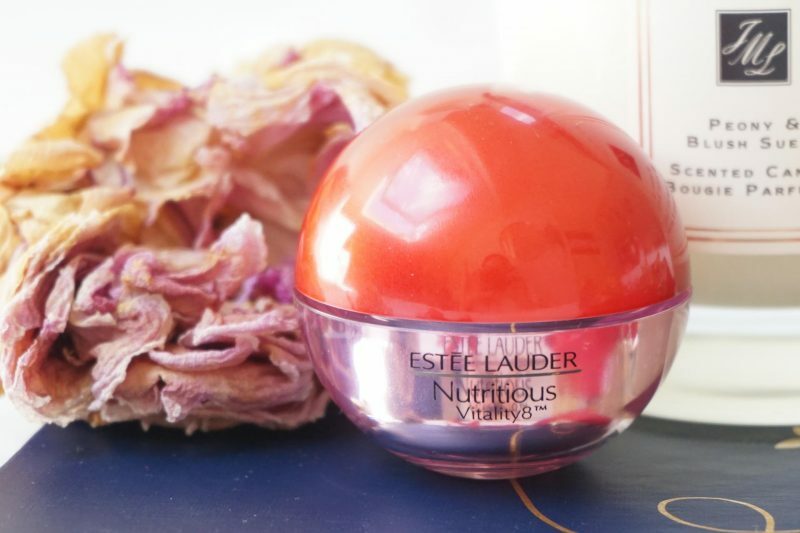 Try the Estée Lauder Nutritious Vitality8 Radiant Eye Jelly because I can guarantee you that there will be results! The cooling effect will feel amazing on your skin and I promise you that the cooling effect will take care of the swollen skin around your eyes. or just buy it because of the funny jelly texture, totally worth it! I will repurchase it and recommend it to friend and family. I think Asian Beauty lovers will go crazy if they see this. AND after using it for 3 weeks I didn’t see the amount of product disappear in the jar. Looks like you can use it for a very long time! 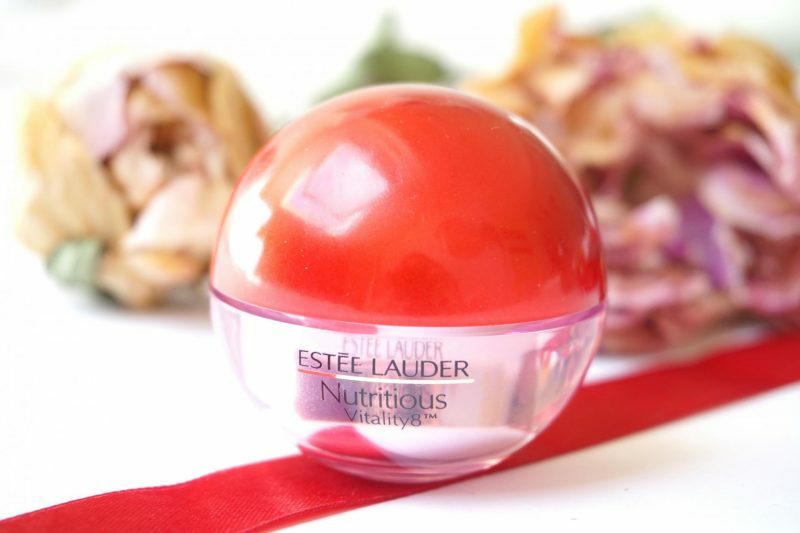 You can get your own Estée Lauder Nutritious Vitality8 Radiant Eye Jelly for €50,-. Looks like a special but good product! Got this on Boots – its amazing!!!! Buy it and don’t have any second thoughts cos every penny is worth it!